If you don’t like goat cheese, you could substitute plain yogurt for a similar (admittedly not the same) tangy, creamy effect. If you want to make this dish super easy, purchase two of the “Harvest Medley” bags of pre-cut turnips, yam and butternut squash from Trader Joe’s and use them in place of the turnips, beets, and butternut squash in the recipe. Otherwise, follow the recipe as written. Enjoy! Heat olive oil in a medium pot over medium-high heat. Add onion and cook until translucent, about 3 minutes. 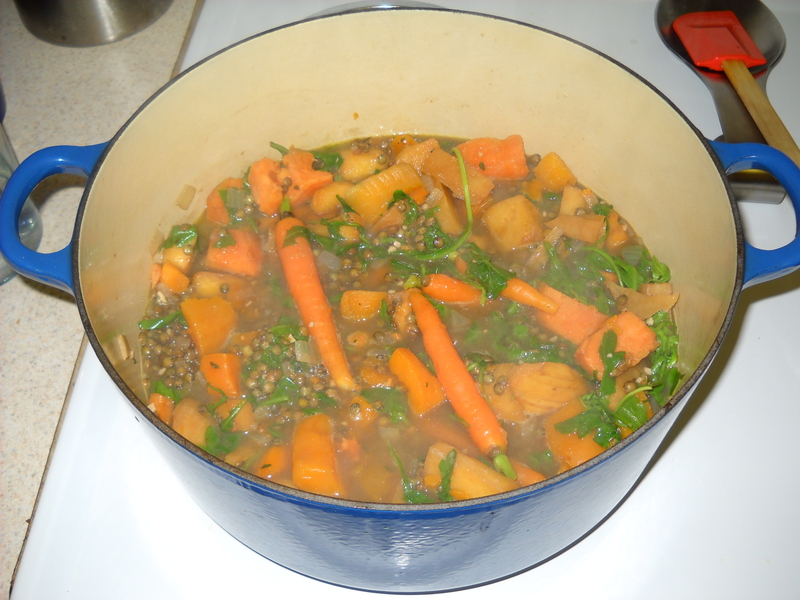 Add garlic, lentils, salt, pepper, thyme, and 4 cups stock. Bring to a boil, then reduce heat to medium-low. Add turnips, beets, and squash and simmer gently, stirring occasionally, 20 minutes. Add arugula and carrots and cook 10 minutes, or until vegetables are tender and most of the liquid has been absorbed. Remove from heat and stir in parsley and goat cheese. I made this tonight, and it was very good. I don’t know what 1/2 inch pieces look like -so I guessed and cooked until everything was tender. Thanks. I will absolutely make this again, once I get through this bunch. Do you think it can be frozen, without the goat cheese? Our other sister, Jen, said this was so good that the first time she made it, she made it 3x that week! So we tried it last night, and could not get enough of it! SO beautiful, and packed with great nutrition. Today we’ll make a large batch in our Culinary Group at work. Dani – thanks! Car has told me about your work – such good things you are doing. I’m happy to provide a little inspiration! Best, K.
Just finished off the last of the leftovers for lunch in the office. Some not so happy noses around but one happy tummy.